When this title came up for review, what caught my attention was the place mentioned in the title. I remember many years back, my father had taken us to the Bhagavathi Amman temple in Chottanikkara, Kerala. I couldn’t recollect much of the temple visit now but it had a spooky feel to it. We were told - “Inga pei verattuvaanga” (they chase away the demons here). Years later, a book with the similar sounding title based out of Chottanikkara along with a scary cover image popped up in my inbox. Curiosity pushed me to opt for the book review. When I started reading the book, I just couldn’t go past the first 30-40 pages. It was gory, violent and I struggled to make any progress for nearly 4 days. Then on a late Sunday evening, I broke the barrier and finished reading the rest of the book in one go. The story revolves around Devi, a young female protagonist who is brave and skilled enough to slay the demons that attack the village of Chottanikkara. If you read “Kanda Sashti Kavasam”, you would have come across the different names of demons. All of them find a mention in this story. She knows the weaknesses of the various demons and ways to destroy them. A new demon enters the village, attacking common people in a gory manner. Devi doesn’t have any clue about this new demon. With the help of her teacher Parasurama, she learns about this demon, traces its past and finds a way to destroy her. Along the way, she also needs to take tough decisions based on righteousness. 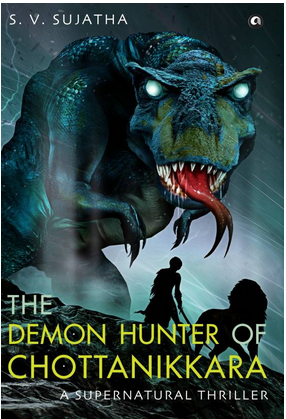 Whether she wins over the new demon or not forms the rest of this engaging story. I was so engrossed in the plot that I was reading it almost close to midnight while the rest of my family was sleeping. It reminded me of the times when my brother and I used to watch horror movies together late in the night. If you are intrigued by super-natural phenomenon, rebirth and slaying of demons, then check out this book. But I must warn you, there are a few gory details and violent attacks. “A warrior is only as strong as his mind"
“You do not know your enemy’s strengths or weaknesses. Yet you have already decided she is unconquerable”. Devi’s character was well-etched and her traits of bravery and strength were well portrayed. I especially liked the part where her teacher explains the background of Yakshi and her agenda. The suspense could have been carried through nicely, if the author hadn’t written about how Miricha and Ela didn’t seem to fear the new demon when Devi warned them. At that point, it was easy to guess that their mother was the demon. Chapter 12 ends with a perfect revelation “A crow”. If only the author hadn’t revealed about Miricha and Ela earlier, this would have been so exhilarating. I was also expecting that Rajan had something to do with the demon but somehow his character was just left hanging. Also it would have helped if the premature blossoming of Pala flowers had an explanation.